“I love how TECH CORPS gives people opportunities. TECH CORPS provides students with knowledge about technology that they probably would have never learned in school.” – Axumawite Gebreyhones. Axumawite Gebreyhones attended a high school that had both a STEM Academy and an Arts Academy. Without having any prior exposure to technology, being part of the Arts Academy was her preferred route. But after seeing a TECH CORPS flyer at her school promoting Computing Career Corps, her journey would change course. Axumawite became enrolled in Computing Career Corps (CCC) in 2016, and she credits the program for giving her a different outlook on technology. Through hands-on lessons and activities, CCC introduces students to a variety of in-demand occupations in the field of technology including computer programming, software engineering, robotics, 3D printing, and app development. Students gain a solid understanding of the inner workings of technology and use their newly acquired skills and creativity to develop solutions and products. After completing CCC, she joined TECH CORPS’ Student WEB CORPS (SWC) program that summer. Student WEB CORPS provides high school students with a suite of web development, project management and professionalism skills and then challenges them to apply those skills in the authentic task of building a website for a mock business. 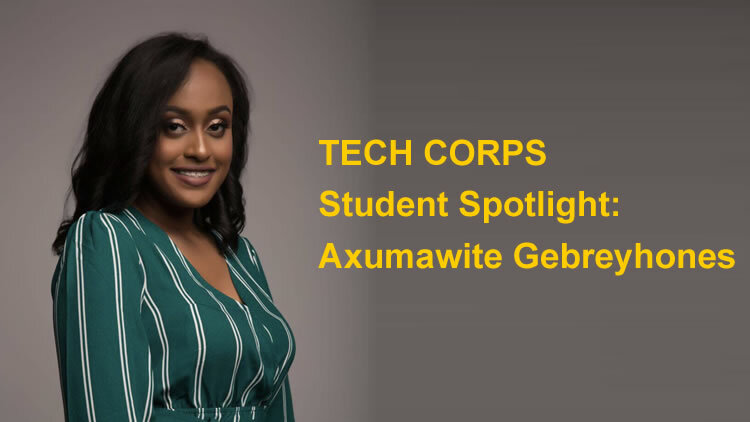 After graduating high school and enrolling in college in 2018, Axumawite was hired by TECH CORPS to serve as an instructor for SWC. Now a freshman studying Civil Engineering at The Ohio State University, this future engineer, who previously wanted to be a lawyer, thanks TECH CORPS for opening up her mind to the functionality of technology. Sounds like Axumawite took her own advice and is already on her way to making her mark in technology!